Barbara Jean Hightower obituary. Carnes Funeral Home. 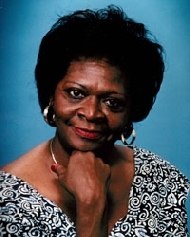 On September 2, 1946 Barbara Jean Hightower was born to Edward Brown Sr. and Bernice Brown-Bell in Galveston, Texas. She accepted Christ and was baptized at an early age atMacedonia Missionary Baptist Church in Galveston, Texas. Barbara lived in LaMarque, Texas where she was a proud member of True Faith Missionary Baptist Church. She was a faithful servant and she truly loved the Lord. Barbara graduated from Central High School 1964 in Galveston, Texas where she excelled at her studies. She retired from UTMB after 40 years of service as a histology technician where she served dutifully. She is preceded in death by her parents, Edward Brown Sr. and Bernice Brown-Bell, her brothers Edward Brown Jr. and Marvin Brown and her sister Doris Brown. In her leisure she enjoyed serving in her church, helping others, fellowship with friends and family, preparing “Soul food Sunday” meals for her family and friends and of course spending precious time with her grandson, Micah. On May 27, 2014 Barbara departed this life to receive her heavenly reward. Left to cherish her memories are her sons, Marvin (Speedy) Highhtower of LaMarque, TX, Leonard (Que Pa) Hightower Jr. of LaMarque, TX, her grandson Micah Leonard Hightower of League City, TX her brother Joseph Lee Brown of Killeen, TX, her sister-in-law, Juanita Brown of Hitchcock TX, her special friend’s Renee Raven of Hitchcock, TX, Kimberly Williams of LaMarque TX and a host of nieces, nephews, cousins and friends. The family will receive guests for visitation and viewing Wednesday, June 4, 2014, from 10AM until 12 Noon at Carnes Funeral Home, 3100 Gulf Freeway, Texas City, Texas 77591. A funeral service will immediatley follow the viewing immediately at 12 Noon, also on Wednesday June 4, 2014 at Carnes Funreal Home, Texas City. Memorials, and Resolutions can be sent to the Funeral Home.